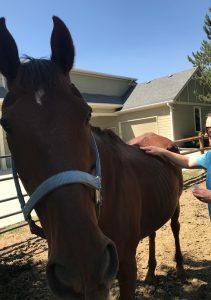 Romeo is a 24yr Thoroughbred with a history of grade 3-4/5 lameness of the right thoracic limb with palpable boney proliferation of the right carpus and secondary moderate to severe atrophy of the proximal right thoracic limb musculature. Sensitivity of the epaxial musculature from the mid thorax to LS region was also present. Acupuncture was employed to see if changes in his comfort level could be achieved. Over the course of four treatments, Romeo was noted by his owners to have subjectively increased activity. While his lameness remained static to progressive, Romeo was much more comfortable on myofascial palpation over the course of his treatments, which correlated with the owner’s perception of improvement in his activity. History and Presentation: Romeo is a 24yr Thoroughbred who presented for acupuncture. He has a history of suspected osteoarthritis of his right carpus due to a hard proliferation around his carpal region. He has been “slowing down” in general recently. He is no longer ridden by the owners. He is currently on an NSAID that was prescribed by a different veterinarian. He has a previous history of colic, and also had acupuncture performed on his back historically. The owner’s goals are to keep him as comfortable as possible, but due to his age are not interested in pursuing many diagnostics or invasive treatments for Romeo. Physical Examination and Clinical Assessments: No ataxia or stumbling was present on gait analysis, and he did not have a wide based stance. Romeo did have a grade 3-4/5 right thoracic limb lameness – his lameness was pronounced at the walk and he would off weight the limb when standing. His right carpus was visually and palpably thickened and hard, most consistent with severe bone proliferation. He had mild swelling of the left tarsus, but otherwise no swelling or thickening was palpable in any other joints. He had moderate to severe muscle atrophy of the proximal right thoracic limb. On myofascial examination, Romeo had mild sensitivity in the left and right cranial and right caudoventral cervical region. He was also sensitive on palpation of the infraspinatus on the right and had trigger points in his triceps bilaterally. He was sensitive to palpation of his epaxial musculature bilaterally from mid-thoracic to the LS region. He also had some sensitivity on palpation cranioventral to his hip. treatments was to focus on the areas of Romeo’s sensitivity on palpation to see if this would make him more comfortable overall. Romeo’s main problem seemed to be his right thoracic limb lameness with the severe thickening around his carpus. Differential diagnoses include right carpal osteoarthritis versus less likely neoplasia vs septic arthritis. He also had muscle atrophy of his right thoracic limb that was most likely secondary to disuse muscle atrophy versus a neurological atrophy. The differentials for the sensitivity that Romeo had in his epaxial muscles and cervical region include compensatory pain from his lameness versus vertebral osteoarthritis versus less likely cervical stenosis or IVDD. Diagnostics were not pursued so I was not able to obtain a definitive diagnosis on this case. 1.) LI16 and LI17 on the right – I used these points due to LI16’s effect on decreasing level of anxiety. During this treatment I also did a trigger point in the triceps, BL 10 due to his sensitivity in this region, and SI 11 due to his infraspinatus sensitivity on the right side. 2.) During the next session I incorporated more points. He was very reactive along his epaxial muscle palpation, so I decided to focus there. seemed more spry and mobile and was moving around more. Both acupuncture and massage were incorporated in all treatments, so the effect from either alone cannot be isolated. There were no adverse events. 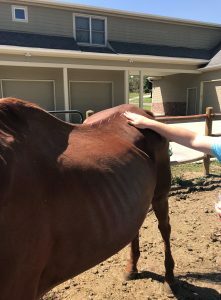 What I learned from this case is that acupuncture can have a significant effect on what was suspected to be compensatory pain from Romeo’s lameness, and that this can result in improved comfort level. While Romeo’s case is somewhat difficult in that we don’t have a definitive diagnosis, with the top suspicion being severe osteoarthritis of the carpus and then secondary compensatory pain, while acupuncture did not improve the lameness, Romeo appeared to be more comfortable overall on myofascial palpation which mirrored his owner’s observations. I think this shows that while acupuncture cannot reverse chronic conditions such as osteoarthritis, it can improve quality of life in patients who suffer from these conditions in that their pain is not just from the primary condition, but also from the effects that their altered gait has on other areas of the body. It has been demonstrated that acupuncture and manual therapy can result in improved mobility in dogs, so it would make sense that this could also be witnessed in horses (Lane and Hill, 2016). Lane, D. M., & Hill, S. A. (2016). Effectiveness of combined acupuncture and manual therapy relative to no treatment for canine musculoskeletal pain. Can Vet J, 57(4), 407-414. Retrieved June 20, 2018.